The AIDS virus is a truly terrifying disease. In the 1980s, at the height of the AIDS crisis in America, that terror was compounded by a lack of knowledge and understanding of the disease. To be told you were HIV positive was tantamount to being given a death sentence. It is from this desperate context that Jean-Marc Vallée’s powerful independent film Dallas Buyers Club brings us the true story of the most unlikely of crusaders. After a workplace accident lands him in hospital, electrician and part-time rodeo cowboy Ron Woodroof is informed that his blood tests have revealed him to be HIV positive. With the hospital participating in a trial of a new wonder drug, AZT, Ron bribes a hospital employee to sneak him the medication. When the AZT doesn’t appear to be doing the trick, he ventures across the border into Mexico where he is able to get his hands on a number of alternative treatments which have not been approved for use in the USA. Seeing an opportunity to make some money, Ron starts smuggling the unapproved medications into the country and, with the help of his transgender business partner Rayon, founds the Dallas Buyers Club, where a monthly fee gets you all the medication you need. The beauty of the Club is it keeps his hands clean. He isn’t selling drugs. He’s selling memberships. Ron quickly becomes the last hope for Dallas’s many AIDS sufferers and starts to face strong opposition from the authorities. 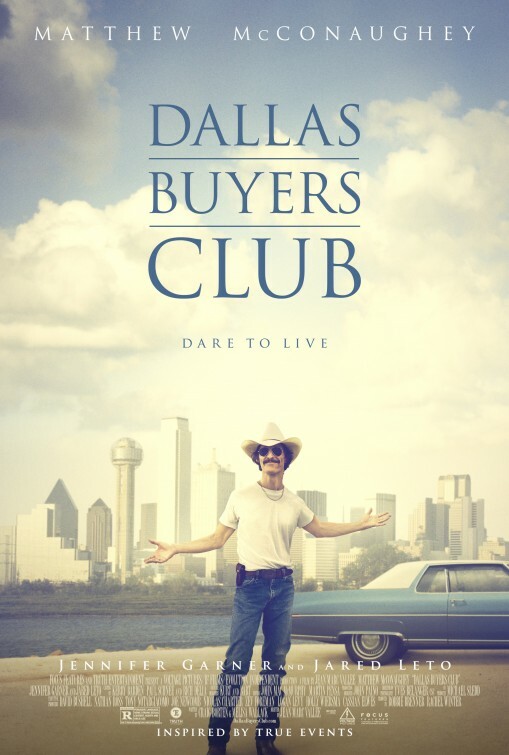 What differentiates Dallas Buyers Club from the standard AIDS narrative is its protagonist. Woodroof is anything but a sympathetic character. He is a whoring, drug-taking, brawling, cheating bigot. The first words we hear from him are a homophobic slander of Rock Hudson, shortly after the actor’s death from AIDS. Upon being diagnosed, Woodroof seems angrier with the doctor’s implication that he might have engaged in homosexual activity than he is about the fact that he is HIV positive. Ron is just as prejudiced against other AIDS sufferers as other people are against him. He founds the Club not out of any sense of charity or desire to help others, but out of simple opportunism. The Club presents him with the opportunity to get his medication and make some money on the side. The film’s drama comes from watching the way this degenerate is transformed by his circumstances and the people around him to the point that he can become an activist and voice for this marginalised community. Craig Borten and Melisa Wallack’s excellent screenplay makes that transition subtle while still apparent, and most importantly believable. Sympathetic he may not be, but Ron Woodroof is engrossing and much of the credit for that has to go to the performance of Matthew McConaughey. Over the last couple of years McConaughey has gone from being a run-of-the-mill movie star hunk to one of the most interesting actors working in Hollywood and his performance here is undoubtedly the best of his career. Having lost approximately 20kgs in preparation for the role, his emaciated appearance is confronting, but Woodroof retains some of that McConaughey charisma, incorporating it into this unattractive package and keeping us hooked on him. But McConaughey doesn’t carry the film alone. His achievement is matched and maybe even exceeded by that of his co-star, Jared Leto. In his first feature film in five years, Leto is brilliant as Ron’s transgender business partner and, eventually, friend Rayon. Leto gives Rayon a real grace and sensitivity, successfully grounding a character that could so easily have been a caricature. Dallas Buyers Club is a special film that manages to be uplifting without being sentimental and insightful without being preachy.